Yesterday my son asked me what my favorite foods were when I was a kid and I quickly responded, “Salad! I remembered telling someone when I was in the second grade that I wouldn’t mind drinking a bottle of olive oil and vinegar.” To which my son scoffed, “That’s impossible. What 7-year-old likes salad that much?” Honestly, I did. I loved salad then and I love salad now. I was always in charge of dressing the salad when I was young. But we didn’t make anything fancy. I just drizzled good olive oil and vinegar with some salt on our greens and that was that. Every time I teach a cooking class, I get very excited when it’s time to demonstrate the salad recipe, and there always is one. Not that I don’t want you to hang out with me, but you really don’t “need” a salad recipe. You just need a few good dressings and then you’re off to the races. I hardly ever make a salad the same way twice, always subbing things in and out depending on what I have and what’s in season. This salad originally debuted in a Mexican-themed class with a handful of cilantro leaves scattered on top. But I photographed it for the blog without cilantro to keep it a little more versatile (and also because cilantro is one of the MOST polarizing foods ever.) So now you can make this for Easter or Passover (without the brittle which contains brown rice syrup, which may or may not be kosher for Passover.) You can certainly skip the brittle, although it is ridiculously good. Or make it another time for a fun “healthy-ish” candy. I have actually considered eating this salad for breakfast. And why not? We have everything I need for a complete breakfast: protein (pumpkin seeds), good fats (avocado, olive oil and pumpkin seeds), good carbs (oranges) and it’s delicious. It also hits all the textures I crave — soft, crunchy, juicy, crispy. Since most of you won’t be eating this salad for breakfast, you can pair it with poultry, fish or lamb or add some feta and a sprinkle of quinoa for a LOVELY luncheon salad. I love this salad so much that I used to make so much of it for my classes so I could ensure there would be plenty left over for me. Can you believe something this beautiful and satisfying can also be so good for you? There’s a whole lot of nutrition on this plate, from powerful antioxidants like Vitamin C and E to healthy fats, fiber and detoxifying compounds. All these ingredients are very much in season right now, so you’ll be able to pull off a very delicious salad. Just remember to buy your avocados hard as rocks several days in advance and allow them to ripen at home on the countertop. They’ll be perfect! Preheat the oven to 325 degrees. Line a small baking sheet with unbleached parchment paper. 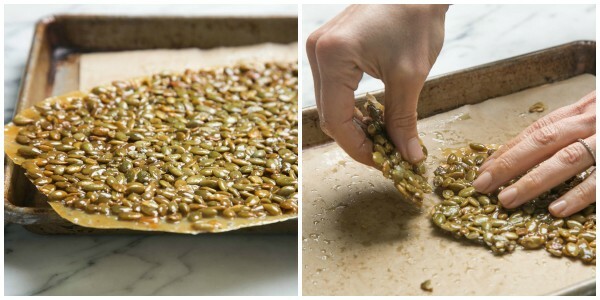 In a medium bowl, combine pumpkin seeds and sea salt. In a small mixing bowl, whisk together the brown rice syrup and coconut oil until well combined. 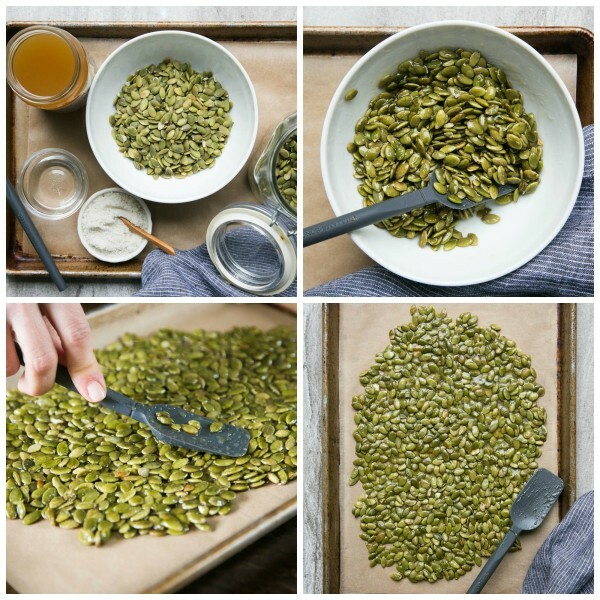 Pour over the pumpkin seeds and stir to combine. Pour mixture onto baking sheet and spread into one even layer using a dampened spatula if necessary. Bake for 15-18 minutes or until golden brown. Allow to cool, break into pieces. Arrange the lettuce leaves on a large platter. Slice the stem and bottom ends of the oranges. Stand the oranges on one end, and following the contour of the fruit with a very sharp knife, remove the peel and white pith. Work from top to bottom, rotating the fruit as you go. Then hold each orange over a bowl and carefully slice between the membranes to release the segments in between. Squeeze any juice left in the remaining membrane into a bowl along with any juice from the bowl of the orange segments. You will have approximately 2- 2 ½ Tablespoons. 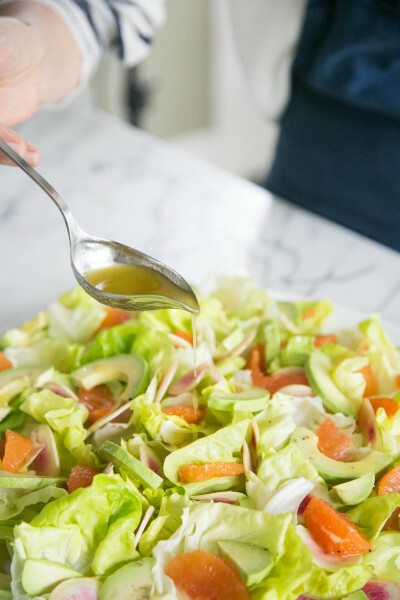 Make the dressing by adding all of the other dressing ingredients to the orange juice. Whisk to combine or place everything in a jar and shake. Set aside. Place the lettuce on a platter. 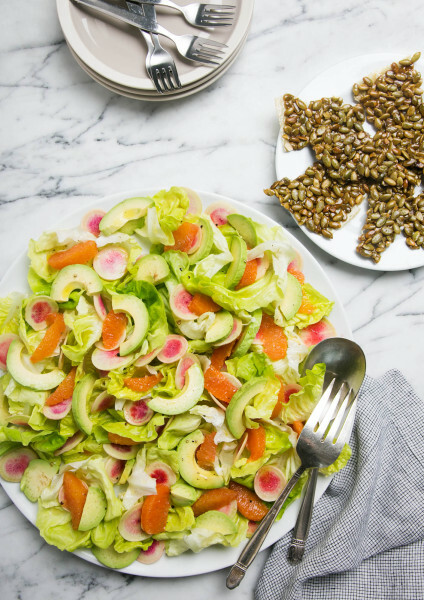 Arrange half the orange segments, avocado slices, and radishes throughout and on top of the lettuce. Drizzle with some of the dressing and toss gently. 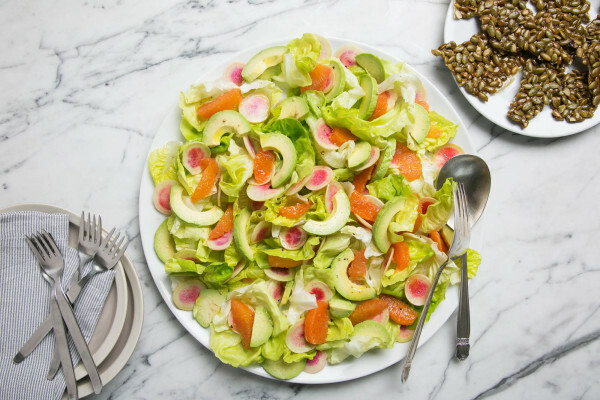 Place the remaining orange segments, avocado and radishes on top of the salad. Drizzle with remaining dressing and serve with pepita brittle and an additional pinch of sea salt. You'll only need about half the pepita brittle. Save the rest in an airtight container for up to one week. *I melt the coconut oil and the brown rice syrup together in a butter warmer. I made this for Sunday dinner and it was a hit! A beautiful salad to look at and tastes delicious and refreshing! Thanks so much for sharing many delicious and healthy recipes! I found you on IG and have made a lot of your recipes in the last couple of months, I am definitely a fan! I make almond milk every day now! You made my day, Michele. So happy you found me! You are my HERO! So inspiring, Monica! Thank you for saying so but I think you are the real hero here with all your wonderful recipes. I wish I had days and days to just look at every single one. You are definitely adding to my treasure chest of good things to eat. I really love it when you explain the nutritional value of everything. It makes me feel good about what we are eating. I feel like I have so much more to learn about clean eating and you are certainly helping. So, thank you…. Brown rice syrup is hard to come by and pricey here in SD. Any subs come to mind? Thank you for a yummy salad idea! Hi Jodi, You can definitely make the brittle with sugar (melted first) and/or corn syrup, but if you’re here, you’re probably not wanting to use those ingredients. 😉 You can order a jar of Lundberg brown rice syrup for $4.50 from swansonvitamins.com and I think they do 99 cent shipping.